Each day, with every step you take, your big toe bears a tremendous amount of stress—a force equal to about twice your body weight. Most of us don’t realize how much we use our big toe.We tend to take it for granted, unless a problem develops. One problem that afflicts the big toe is called hallux rigidus, a condition where movement of the toe is restricted to varying degrees. This disorder can be very troubling and even disabling, since we use the all-important big toe whenever we walk, stoop down, climb up, or even stand. If you have pain and/or stiffness in your big toe, you may have this condition. Hallux rigidus is a disorder of the joint located at the base of the big toe. It causes pain and stiffness in the big toe, and with time it gets increasingly harder to bend the toe. 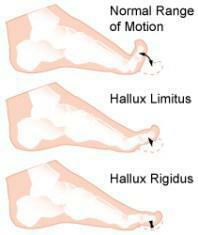 “Hallux” refers to the big toe,while rigidus” indicates that the toe is rigid and cannot move. Hallux rigidus is actually a form of degenerative arthritis (a wearing out of the cartilage within the joint that occurs in the foot and other parts of the body). Because hallux rigidus is a progressive condition, the toe’s motion decreases as time goes on. In its earlier stage, motion of the big toe is only somewhat limited—at that point, the condition is called “hallux limitus.” But as the problem advances, the toe’s range of motion gradually decreases until it potentially reaches the end stage of “rigidus”— where the big toe becomes stiff, or what is sometimes called a “frozen joint.” Other problems are also likely to occur as the disorder progresses. Common causes of hallux rigidus are faulty function (biomechanics) and structural abnormalities of the foot that can lead to osteoarthritis in the big toe joint. This type of arthritis— the kind that results from “wear and tear”—often develops in people who have defects that change the way their foot and big toe functions. For example, those with fallen arches or excessive pronation (rolling in) of the ankles are susceptible to developing hallux rigidus. In some people, hallux rigidus runs in the family and is a result of inheriting a foot type that is prone to developing this condition. In other cases, it is associated with overuse—especially among people engaged in activities or jobs that increase the stress on the big toe, such as workers who often have to stoop or squat. Hallux rigidus can also result from an injury—even from stubbing your toe. Or it may be caused by certain inflammatory diseases, such as rheumatoid arthritis or gout. Your podiatric foot and ankle surgeon can determine the cause of your hallux rigidus and recommend the best treatment. The sooner this condition is diagnosed, the easier it is to treat. Therefore, the best time to see a podiatric surgeon is when you first notice that your big toe feels stiff or hurts when you walk, stand, bend over, or squat. If you wait until bone spurs develop, your condition is likely to be more difficult to manage. In diagnosing hallux rigidus, the podiatric surgeon will examine your feet and manipulate the toe to determine its range of motion. X-rays are usually required to determine how much arthritis is present as well as to evaluate any bone spurs or other abnormalities that may have formed. Medications. Nonsteroidal antiinflammatory drugs (NSAIDs), such as ibuprofen, may be prescribed to help reduce pain and inflammation. Supplements such as glucosamine-chondroitin sulfate and some vitamins and minerals may also be helpful. • Injection therapy. Injections of corticosteroids in small amounts are sometimes given in the affected toe to help reduce the inflammation and pain. function of the joint as well as reduce or eliminate pain. the condition and the severity, as well as the patient’s age, occupation and activity level. Your podiatric surgeon is trained to select a surgical procedure best suited to your particular condition and needs.